Walking down the street, we feel like agents of our own destiny. But perhaps we shouldn’t be so sure. Behavioral scientists like to point out that often we move in a patterned way, as though conforming to natural laws we’re not even aware of. When you look at big groups in places like train stations and shopping malls, crowds sometimes mirror the behavior of liquids—clogging, forming channels, or assembling into vortexes. For two decades, researchers have been trying to pin down just what those laws are. Why do people in crowds move the way they do? The effort has been complicated by a simple fact: Unlike physical particles, which respond blindly to forces, people are capable of making their own decisions, and it’s hard to find a consistent rule to describe them. Hard, but not impossible. 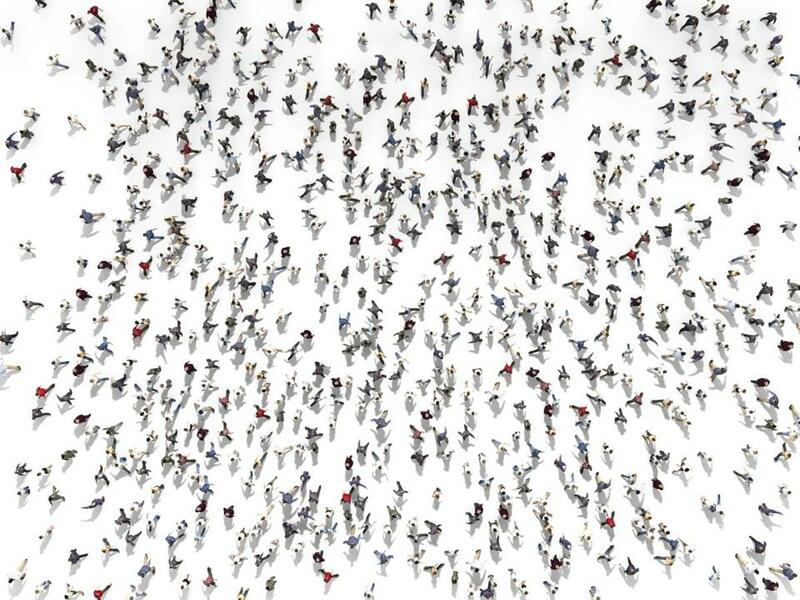 In a study published last week in Physical Review Letters, physicists say they have found a principle at work in crowd motion. Rather than behaving like particles, people appear to move in a uniquely human but roughly predictable way—driven by precise but unconscious calculations that help us avoid collisions. “People, as they move through crowds, are always extrapolating into the future and deciding how far they are from colliding,” says Brian Skinner, a condensed matter physicist at the Argonne National Laboratory in Illinois and one of the authors of the paper. Skinner and his coauthors, a pair of computer scientists at the University of Minnesota, looked at six data sets that capture individual movements in crowded places: four from natural settings, like video footage of pedestrians on a college campus, and two from laboratory experiments, in which participants were tracked with cameras as they navigated a corridor that narrowed into a bottleneck. Such data sets have become available only in the last five years, as improvements in camera technology and the field of computer vision have made large-scale pedestrian tracking possible. So the researchers went looking for a new rule. They found it in a variable they called “time to collision,” which explained many of the course adjustments they observed. The closer two people get to colliding, the more energy they expend getting out of each other’s way. To be technical, they found that the interaction between individuals in a crowd could be described as 1 over the square of the time to collision: As a collision becomes more imminent, the energy you apply to avoiding it goes up drastically. Unlike with particles, the mechanism that produces these adjustments is an instinctive mental calculation rather than any kind of physical force. There’s also a limit to how far out we can—or need—to account for other people’s movement. When the time to collision was more than three seconds, the researchers found that the interaction energy between two pedestrians fell to zero, meaning people weren’t taking each other into account at all. Crowd modeling is also useful for creating training environments, in which event managers or soldiers can practice crowd control, and for making movie and video game animations more convincing. (“Artists can’t simulate every person in a crowd,” says Guy.) Eventually this kind of research could allow site managers to create real-time models of crowd behavior, allowing them to forecast and maybe prevent events like stampedes. These types of applications suggest that even if people don’t behave in crowds like masses of electrons, that doesn’t mean we’re not our own flavor of elementary particle. Call it the person particle: It may have a mind of its own, but it turns out to be fairly predictable all the same. • 2013: Yes, but what are neutrinos for?